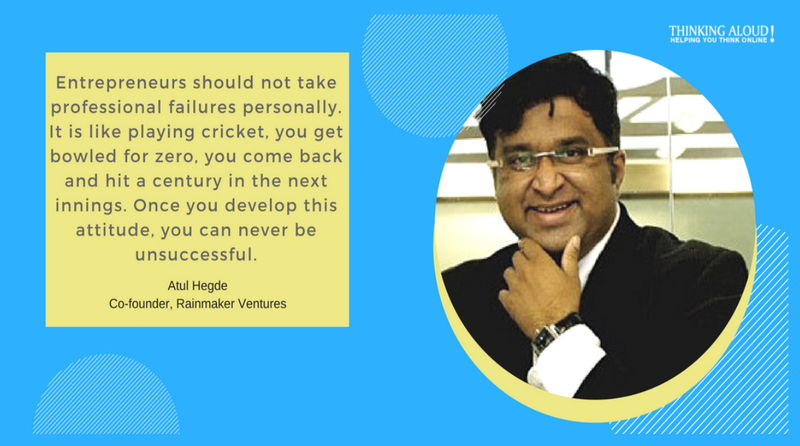 In an exclusive interview with Ashutosh Asthana, Assistant Editor, Thinking Aloud, Atul Hegde, Co-founder - Rainmaker Ventures, speaks about the importance of funding and networking for a start-up. TA: How did you get the idea to start Rainmaker Ventures? AH: In my previous avatar, I spent a lot of time working with newer companies, looking at acquisitions within the group, so there was anyway a lot of interaction happening across Southeast Asia with emerging companies, emerging technologies in the digital content marketing space. Then I thought that this is the space to worth getting into full time and so that is how Rainmaker Ventures was started 3 years back. TA: For any startup, funding is a major issue for the company, so, how should a startup tackle that issue in the early phase? AH: I think one solution will not apply on every startup, depending on the work they do, the idea they want to fund etc. So, depending on what lifecycle you are, there are different avenues. Today it is better than 5-6 years back. There are a lot of options now to pick up funding. I think what you really need to be sure of is what is it that you are asking for, at what phase your startup is, at what phase your product idea is and who are you approaching to get funding. So, a little bit of knowledge about that is very important. For instance, if you are at a very early stage, looking to fund an idea, then there is no point going to a venture capitalist or to companies that have nothing to do with you, in fact, it is better to reach out to your networks or individuals in your circle. It all depends on common sense, there is no hard and fast rule that determines how to get funding. I think it will always be a hit and miss but you have to be on it always. If you are just starting off, then be very sure what the minimum that you need and try and ask for as little as possible till you reach that next phase. Typically what happens is, people, don't have the idea. What they say is, "now let me raise a million dollars!" It is of no use, you don't know what you will do with that money. If you ask as little as possible, your success rate of getting that amount is much higher. TA: What challenges did you face as a co-founder during your early days? AH: To be honest, I didn't face a lot of challenges because I was starting after 2 and half decades of working, there was enough networking. So, my challenges were much less than what a typical startup founder would go across, who has just come out of college or maybe 4-5 years of working. My challenges were more of a mindset challenge, it was not a resource challenge like, to become an entrepreneur full time versus being a professional. So those were the mindset challenge that was there, but nothing was there from a resource point of view. TA: How important is networking for any budding entrepreneur? AH: I think, networking sometimes is wrongly used. It doesn't mean that you crash every party or event in town. Networking means that you need to be extremely aware of who matters the most, who are your peers, who are your competitor. So, networking doesn't mean that you have to meet everybody but you need to be aware, you can connect with them on LinkedIn or other social media platforms. I think awareness is the number one tool for networking. TA: How do you see the growth of technology in the digital industry right now and where do you see it in next 5 years? AH: Technology is reshaping the digital industry and it will change it in future as well. There are many new technological advancements taking place, Artificial Intelligence, Blockchain, etc. and these technologies will keep evolving. We don't know what is relevant 5 years from now but I think as a whole the growth of the industry is extremely positive and that's how it will go. I don't think this question will arise 5 years from now because it will become so much part of our life that we can't imagine now. TA: How should an entrepreneur bounce back from failure? AH: My advice for entrepreneurs on this is that they should not take failure personally. Indians tend to take professional failure as a personal failure. Unlike the West where when you are fired, you just leave your work that day and you are up and about looking something else, they do not take these things as rejection in their personal lives. Due to our social upbringing, we take professional failure as social rejection. It is never a rejection, it is just that you failed at that point of time in your professional path. I think if you are able to make peace with that then it is like playing cricket, you got bowled for zero, you come back and then in the next inning, you hit a century. Once you develop this attitude, you can never get unsuccessful. TA: What are the future goals of Rainmaker Ventures? AH: We started off as an agnostic fund. Our investments are now slowly leaning towards digital media content, analytics around it, anything new that comes in the entire digital marketing ecosystem. So, we are extremely bullish about that. We are going to look at assets not only in India but also Asia, the US within the kind of size of the investment appetite that we have. While we are open to other sectors, we want to go deep in this entire segment. TA: What is your mantra for success? AH: Success can be defined on a very broad level and that time it becomes a lot of factors, personal, professional, peace of mind, health etc. Success can also be defined as how did the day went today. For me personally, it is about digging one day at a time. Some days are good, some days are bad. You won't get successful every day but as long as the number of days you are successful outnumbers the number of days you are not, I think you are doing well. The author is the Assistant Editor of Thinking Aloud.